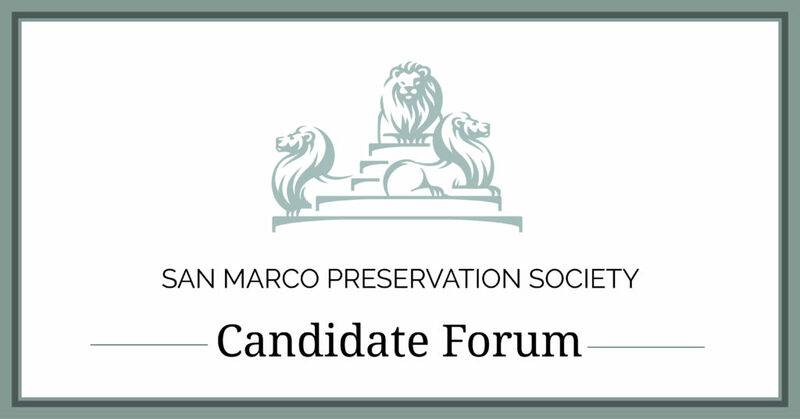 The San Marco Preservation Society is hosting a candidate forum for each of the Duval County candidates seeking election to City Council At-Large seats. The forum will be held at the San Marco Southside Baptist Church on Monday, Feb. 11 from 6:30 to 8:00 PM. This event is an excellent opportunity for members of the public and San Marco residents to meet the at-large candidates, ask them questions, and understand their goals and priorities for office. In addition, several other candidates and elected officials serving District 5 will be in attendance. The Duval County Primary Election is Tuesday, March 19. Please stay tuned for more event information.